If today you saw a young officer doing this you would have words with them to tell them this is not acceptable? Yes says Smith. 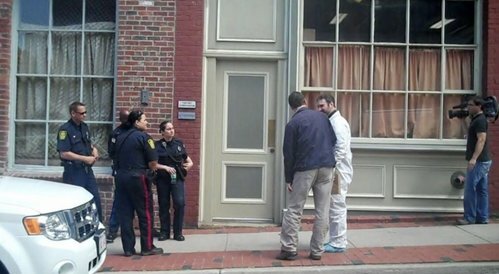 Lacy shows second photo of funeral home workers and officers leaving with Oland’s body without show coverings. Isn’t this the one thing you should have insisted on - even if you couldn’t stop officers and outsiders from entering the scene / that at least everyone should have covered their feet? Yes. Asking now about Inspector McCloskey. Are you aware he suggested you invited him into the scene? I heard that. Did you? No. Lacy asks about Smith's previous testimony about giving in to senior officers who "wished to view" the body before he had finished processing the scene. Suggests he could have at least insisted they wear booties. Smith agrees. Former deputy chief Glen McCloskey testified Smith had "invited" him and other officers in. Smith testifies he did not. The incident where you catch McCloskey and Sgt. Oram in the office does not appear in your notes. No. Why not? Not sure. Did you leave it out of your notes on purpose? No. You should have included it? Yes. All 3 testified that Smith was not happy and ordered them out. Lacy points out that Smith made no notes about this. Correct, says Smith. 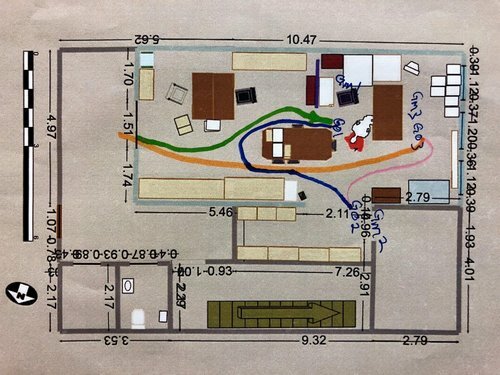 Lacy shows Smith zig zag diagram drawn by Sgt Greg Oram of his path into the crime scene when he was with McCloskey. “You would be appalled by that,” if you knew that was where they walked says Lacy. “I am,” says Smith. Did you purposely leave it out because you were embarrassed they were in the scene when you hadn't finished processing it? asks Lacy. "I can't tell you why I left it out," replies Smith. "Absolutely wrong to leave it out?" Yes. "In effect, it’s inexcusable, correct? This route - had you known about it would - have been a complete and utter shock to you? Yes. Smith had directed officers - including McCloskey in his first visit to follow a route into and out of the scene that was tight to the wall. The route Oram sketched was well outside that boundary. This is apparently the first time Smith is learning of how bad the wandering was. To get so close to the victim’s body would have the possibility of interfering with trace evidence? asks Lacy. "Very possible," replies Smith. 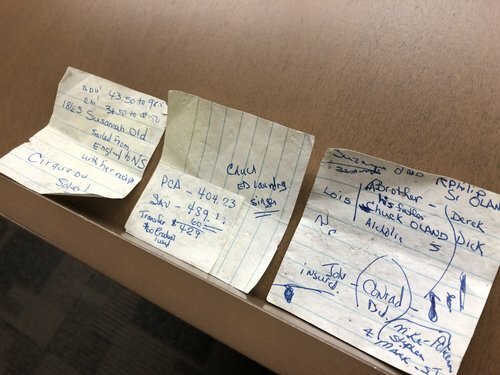 Lacy notes police asked Richard Oland's secretary Maureen Adamson to go into the office on July 9 - before analysis - to see if she noticed anything missing. Did you authorize that? I don't think I was asked, replies Smith. Although most of the blood would have dried by then, there was significant pooling - still a chance of transference? asks Lacy. Yes, agrees Smith. Could create problems for analyst? Yes. You didn't advise Wentzell because you didn't know? Correct. You remember being tasked with locating a will? asks Lacy. Yes. 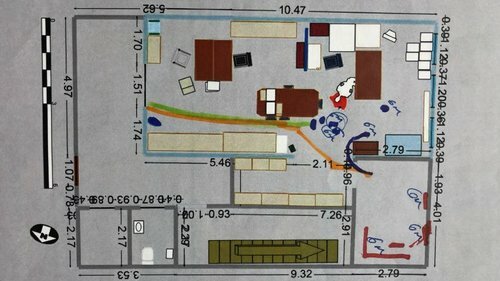 Lacy displays on large scene in courtroom a photo of the victim's desk with a blood-spattered documents on it. One appears to be genealogical will, agrees Smith. If you have to move something in a bloody crime scene, it's important to document it, not to put it anywhere else in the scene where there's a risk of transfer? asks Lacy. Yes, agrees Smith. Lacy asks about victim's eyeglasses. Smith says they were underneath the body. He had been asked to look under the body for any possible weapon. You made a note that the glasses were visible? Not that they were visible, just that they were "on the floor." Lacy displays another photo of the blood-spattered glasses later on the victim's blood-spattered desk. Asks about remote control found on the floor, which Smith had previously testified to moving. Smith said he turned it over to photograph it, then moved it out of the way of funeral home employees during removal of body. Lacy displays another photo of the remove on top of some filing cabinets. Lacy notes the remote appears to have some blood on it. Did you swab it? No. Did you bag it for evidence? No. You were never asked to analyze them for fingerprints etc? asks Lacy. No, says Smith. They never came into the forensics office, I was never notified about them, he says. Lacy advises the court he expects to wrap up his cross-examination of Smith before lunch tomorrow. Then the Crown will have an opportunity for redirect. Oland retrial adjourns until 9:30 a.m.
After a long, difficult day of cross-examination, Smith leaves as pleasant and polite as ever. "Good night." "See you in the morning," he says to multiple people on his way out.